Click here to read the PDF version of the full report. The European Commission transfers hundreds of millions of Euros annually to political advocacy organizations globally through frameworks such as EIDHR, PfP, AIDCO, the Anna Lindh Foundation, and others. In many cases, particularly in the Middle East, this European Union funding is allocated in non-transparent processes to organizations whose activities are entirely inconsistent with the stated objectives. 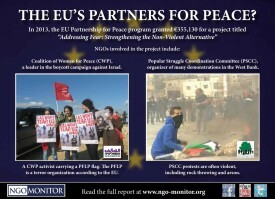 In previous reports, NGO Monitor analyzed EIDHR (European Instrument for Democracy and Human Rights) and PfP (Partnership for Peace) funding processes related to the Arab-Israeli conflict, including the lack of transparency and the stark contrast between the declared objectives, as stated by the EC, and the agendas and expertise of recipient organizations (see Appendix 3). Many of the grantees are involved in promoting the Durban strategy of political warfare and demonization. This report examines one case in detail – EIDHR and PfP grants (total €602,798 for 2011-2014) to the Coalition of Women for Peace (CWP) and partners. CWP is a leader in the campaigns to demonize Israel, including boycott, divestment, and sanctions (BDS) via the “Who Profits” website, and sponsoring “Nakba Day” activities that repeat Palestinian narratives. EC policy opposes BDS and other forms of demonization as counter-productive to peace efforts. In 2011, due to CWP’s radical activities, the US-based New Israel Fund (NIF) ended funding of CWP. Dalit Baum, co-founder of Who Profits, is well known for her involvement in public events around the world that target Israel through highly biased and radical rhetoric. CWP’s partners in the PfP grant include the Palestinian Popular Struggle Coordination Committee (PSCC) and Nova, a radical Spanish political NGO. The overlapping grants from the EC to CWP and its partners are ostensibly to empower women’s peace movements and support non-violence in the Arab-Israeli conflict. No evidence exists of these groups’ expertise, experience, and capacity to achieve the objectives stated in the EHIDR and PfP grants. On the contrary, the available evidence suggests that the funds will be used to promote the hatred and demonization that fuel the conflict. Therefore, many questions arise regarding the EC’s decision-making, due diligence, and potential conflicts of interest among officials involved. The evidence suggests that EC officials involved in approving these grants either lacked the competence and expertise to assess the NGO applicants or chose to ignore the available information. However, as in similar grants for political advocacy NGOs, the EC has refused to release significant documentation that would allow for analysis of this funding. Multiple requests, documented in Appendix A, were met with minimal responses, vaguely citing “public security” as justification. While the EC argues that grants are for projects and not for the organizations, this claim is artificial and unsupported by the evidence. These responses prevent critical debate, violate the EC Freedom of Information policy, and highlight the intense effort to prevent investigation of this potentially irresponsible and unaccountable EC activity. 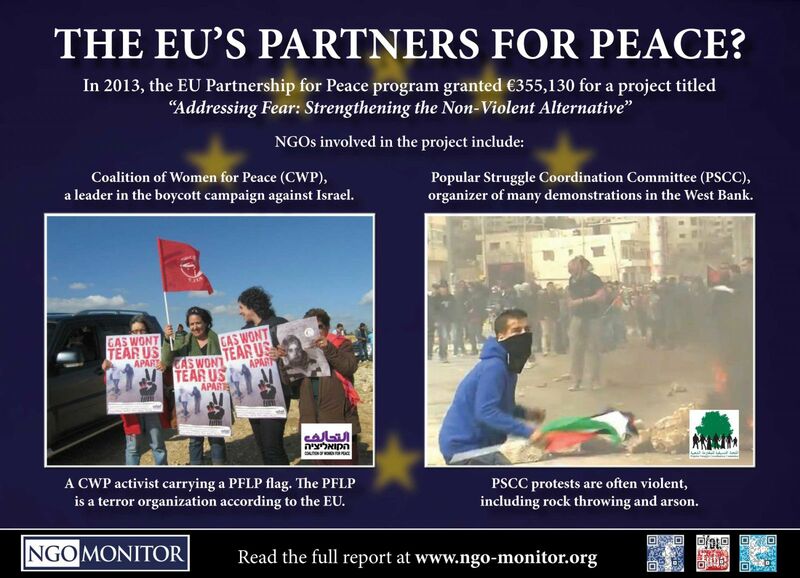 Previous reports by NGO Monitor analyzed EU funding for political advocacy groups active in the Arab-Israeli conflict, including through the frameworks of the European Instrument for Democracy and Human Rights (EIDHR), Partnership for Peace (PfP) and the Anna Lindh Foundation. (See Appendix 2) Many of the NGOs funded by the EU were shown to promote agendas that are highly inconsistent with declared policy objectives; instead of supporting peace and democratic development, their activities increase the conflict. Furthermore, the EU funding frameworks failed to undertake independent evaluations, instead relying on self-reporting by the NGO recipients, in violation of the norms of good governance. As a result, EU officials may not know what is actually being done with this funding. In addition, as demonstrated in detailed examinations of the available documentation, the decision making process in these EC frameworks is highly secretive and also violates due diligence requirements for public funding processes. The EU funding frameworks do not have a requirement for independent evaluations of the activities of these NGOs, and when there are evaluations, these documents are not made public. Requests for the relevant documents were repeatedly denied by the EC, on the grounds of dangers to “public security,” which, as detailed by NGO Monitor, lacked a substantive foundation. In this report, NGO Monitor examines two examples of such misdirected and unsupervised EC funding for an organization known as the Coalition of Women for Peace (CWP) – one in the EIDHR framework (“Empowering Women, Building Peace” €247,668) and the other under PfP (“Addressing fear: strengthening the nonviolent alternative,” €355,130). This detailed analysis demonstrates the fundamental contradiction between the objectives of this funding, as stated by the EC, and the political activities of the NGOs chosen to implement the project goals. The EC justification claiming that the funding is limited to specific projects, with no relationship to wider NGO activities and objectives, is demonstrated to be misleading and inconsistent with the evidence. The activities of many grantees promote the Durban strategy of political warfare, including participating in BDS campaigns, facilitating violent protests, and demonstrating solidarity with terrorist organizations. In addition, the impact of the secrecy in the EC’s decision making processes in these two examples is presented for Parliamentary examination. According to the EU delegation head in Israel, in the 12-year period of 1999 to 2011, 158 grants were given to Israeli, Palestinian, Jordanian, and European organizations, involving a budget of €61 million. (In most years, EIDHR fails to publish a detailed list of grants, but in 2009, when this information was made available, half of EIDHR’s Middle East budget went to promote human rights in Israel and the West Bank, with no grants related to Syria, Iran, Saudi Arabia, and other chronic violators. Among the many NGO recipients of these grants, the CWP is currently a recipient of both EIDHR and PfP funding, involving a combined total of €602,798. (Overlapping grants from both agencies for a single NGO is quite common among these EC frameworks.) In 2011, CWP received EIDHR funding under a project entitled: “Empowering Women, Building Peace.” According to the description, this grant is intended to “contribute to the realization of social, civil and political rights of women in Israel, in accordance with international commitments made by the state of Israel.” EIDHR funding covers 70% of the total costs, which amounts to €247,668 over the course of three years. In 2013, CWP also received a PfP grant for a project entitled “Addressing fear: strengthening the nonviolent alternative,” which is aimed at “increasing human security of communities directly affected by the conflict in the West Bank, though (sic) the creation of a Conflict Early Warning System (CEWERS) network of 13 communities able to ensure respect for rights of individuals and communities.” Other grant recipients include the Palestinian Popular Struggle Coordination Committee (PSCC), Nova – Centre for Social Initiative (Spain), and Al Quds University. This activity was awarded €355,130 under PfP, which is 71% of the total budget. While the EIDHR and PfP project descriptions use the language of human rights, peace, and democracy, the activities and agendas of the grantees stand in sharp contrast to these principles and to declared EU foreign policy. As shown in detail below, CWP actively promotes anti-Israel incitement, BDS (boycott, divestment, and sanctions) campaigns and demonstrates solidarity with terrorist organizations. In addition, none of the groups has a record of activities that demonstrate competence in the areas covered by the EIDHR and PfP grants. Either the EC officials involved in approving these grants were ignorant of this record, or they deliberately and inexplicably chose to ignore it. CWP is a leader of the boycott, divestment, and sanctions (BDS) campaign, particularly via the Who Profits framework, and is involved in many aspects of anti-Israel demonization, including lawfare, apartheid rhetoric, etc. “Who Profits” – CWP’s flagship BDS campaign. The website serves as an “online database and information centre” initiated “in response to the Palestinian call for boycott, divestment and sanctions (BDS) on Israel,” and “a key asset to the global movement of economic activism and BDS.” A number of boycott examples, such as the G4S security company, are attributed to this campaign. In addition to Who Profits, CWP repeatedly endorses anti-Israel boycotts and calls on activists to target corporations such as Carmel Agrexco and Ahava cosmetics, while promoting university divestment campaigns at UC Berkeley and UC San Diego. The CWP Facebook page features pictures of CWP officials holding a PFLP flag during a rally in Bil’in (the site of often violent clashes between Palestinians and Israelis) in 2012 (Appendix 3). The Popular Front for the Liberation of Palestinian is a terrorist organization, as recognized by the EU, and is responsible for numerous attacks against civilians. In May 2013, as part of CWP’s “Nakba Day activities” (on which Palestinian commemorate the “catastrophe” of the establishment of the State of Israel in 1948), CWP launched its four-day “Bulldozer Campaign,” linked to BDS, targeting corporations. Through social media, CWP focuses on each company’s activity related to “the demolition of homes and lives in communities across Palestine.” This campaign is also promoted by CWP’s partner – Kairos Canada. In 2011, the New Israel Fund (NIF), an organization that aims to advance “democracy and equality for all Israelis,” announced that it would stop its funding of CWP. A central figure in CWP; co-founder of CWP’s flagship BDS campaign “Who Profits” and formerly served as the campaign’s project manager. According to Baum’s profile, “She has been active with various groups in the Israeli anti-occupation and democratization movement, including Black Laundry, Boycott from Within, Zochrot, Anarchists against the Wall and Women in Black.” As shown in detail below, Baum lobbies international audiences on how best to promote the global BDS campaign against Israel. In 2011 Baum also spoke at the Israeli Apartheid Week in New York in 2011 on “framework for examining corporate accountability for the occupation, and offer some of the latest results of Who Profits’ 4-year research effort underlying many of the campaigns around the world.” In 2010, Baum “testified” in the Russell Tribunal (RT on Palestine) in London – a propaganda forum that uses a legal façade. Nova is based in Spain (Catalonia) and was founded in 1999. It claims to promote transparency (accountability); non-violence for social change; alternative economic systems and democracy. Nova, as contractor in partnership with CWP, PSCC, and Al Quds University, has been granted €355,130 through the PfP (Partnership for Peace) program. According to NOVA’s 2009 annual report (the latest available) funders of Nova in 2009 included the Catalan Agency for Development Cooperation, the Council of Barcelona, the Spanish Agency for Development Cooperation (AECID), and the Province of Barcelona. AECID continued to fund NOVA in 2010 and 2011. The Autonomous Community of Catalonia funded NOVA from 2010 up to 2012. NOVA supported the “Rumbo a Gaza” initiative, which attempted to break the Israeli blockade of Gaza in 2011. In 2009, NOVA published an 84-page report titled “Spain-Israel: Military, Armaments and Security Relations,” which attempts to “answer the question of how Spain contributes to violence in one of the most battered regions of the World.” The report has a forward written by Jeff Halper, director of the political NGO calling itself the “Israel Committee Against House Demolitions” (ICAHD), which has also received EU funding under EIDHR. PSCC calls for resistance to the Israeli occupation through “marches, strikes, demonstrations, direct actions and legal campaigns,” as well as boycott, divestment, and sanctions (BDS) campaigns. Moreover, PSCC has been a facilitator for protests that have turned violent (see below). PSCC uses apartheid rhetoric when referring to Israel. Its website refers to the anti-terror separation barrier as the “Apartheid Wall” and to highway 443 as the Apartheid Road. Through its website, PSCC regularly promotes Palestinian BDS campaigns and activities. PSCC helped organize the demonstrations in the E1 area that took place in January 2013. In partnership with CWP, NOVA, and Al Quds University, the Popular Struggle Coordination Committee has been granted €355,130 through the PfP (Partnership for Peace) program. Due to non-transparency, further information on funding for PSCC could not be found. In order to understand the EU’s decision to fund these political advocacy NGOs, NGO Monitor requested documents relating to the funding of CWP under EIDHR and PfP. The response from the EC consisted of four marginal and redacted documents that provide no insight into the decision-making process and highlight the lack of transparency (Appendix 1). While minutes of meetings were requested in order to understand the underlying premises of the selection, the institutions responsible were unwilling to reveal these documents. Written assessments regarding the relevance, quality, efficiency, impact, and sustainability of the projects have been completely redacted. Additionally, the scores and grading from the evaluation sheets have been concealed, making it impossible to understand the quantitative assessment of the projects. This lack of transparency suggests that either the commission is unable to provide further information because it does not monitor, document, and appropriately evaluate the projects being funded, or this institution wants to conceal its motives for funding CWP and similar organizations. Implement transparency principles in order to provide full access to EU documents related to such funding of political advocacy NGOs. Implement a system of independent professional evaluation for all grant recipients, including the organization’s full agenda and objectives, in order to ensure that grantees share the values and goals specified in allocating the funds. Replace reliance on rhetoric in applications for evaluation with informed and independent assessment of the applicant’s capabilities and prior activities. In this case, the grants to CWP for work in promoting peace and non-violence stood in clear contrast to the organization’s agenda and activities. Create an independent ombudsman office in EIDHR, PfP, and other EC funding frameworks for NGOs to ensure that evaluations are based on professional competence and free from conflicts of interests. Coordinate evaluations and grants among different EU funding frameworks to avoid situations in which a single organization obtains two grants in parallel. Ensure that all monitoring reports are available for independent evaluation to allow taxpayers and stakeholders to understand the use of government funds, and ensure that they are used for the purposes intended.